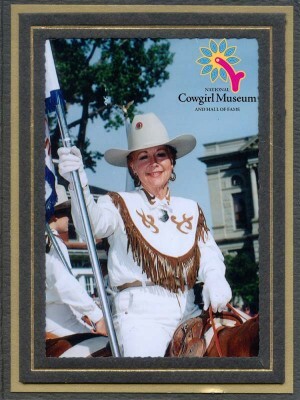 Although this cowgirl’s resume reads long and broad, Arlene is commonly known for her work with Cheyenne Frontier Days, where she acted as chief goodwill ambassador. Her interest in rodeo started as a teenager, and she dallied in trick riding and barrel racing. Arlene rode in the 1958 Brussels World Fair before adding trick water skier to her repertoire. She created the Cheyenne Quadrillettes, an equestrienne drill-team, as well as the Cheyenne Frontier Days Dandies, a riding group dedicated to promoting Cheyenne Frontier Days. Since 1979 she has been involved with Miss Rodeo America, serving as one of the first women on the executive board. An accident ended her water skiing career, but created new outlets for her talents. She is active with the Amputee Coalition of America, and led the effort to build a new blood donation center in Cheyenne.